As an online motorcycle quest, ThrottleQuest's main strive has been to bring forth innovations, ideas which are not necessarily radical, but make sense and are aimed towards providing logical services to the end user. In that quest, even the smallest effort done by someone catches my fancy. In a time, when manufacturers are at war towards providing more and more Bhp at disposal, thus creating far more sophisticated and complex machines, no one is giving much attention towards providing services to the end user that would not only make them a better riders, but also a better and more knowledgable user of their machines. Bajaj has recently upgraded their website and have tried to think out of the box. But when it comes to thinking out of the box, well, BMW always takes the lead and the BMW S1000RR is a glaring example of their attitude. Recently, BMW UK has launched an online motorcycle support facility, for the motorcycles BMW has launched in the last 10 years. Rider's Manual - Owner's handbook in PDF format for the selected models. Electronic Parts Catalouge - A comprehensive catalouge for the various parts installed in the motorcycles of the user's choice. Break down dictionary - BMW has actually taken the pain to collect the most important break down terms in a number of languages, so that the end user can effectively communicate issues to the support facility. Tyre Options - A detailed guide for the right tyre option for the selected motorcycle as per BMW's standards. Just refer the guide and it would tell you what's the most suited tyre for your motorcycle which abide by BMW's norms and standards. Seriously, that's some real comprehensive work done on part of the BMW Motorrad and shows the kind of commitment the organization has towards it's end users. That's what I call walking the extra mile and rising above others. 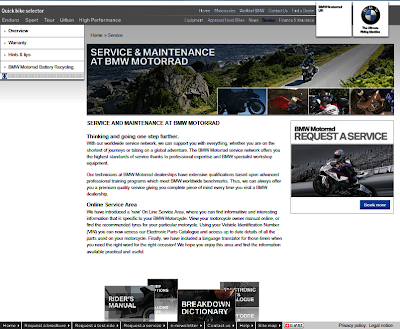 Hat's off to BMW Motorrad.